JONATHAN KARL: Mr. Speaker, I'm sure you're gettin' an earful from your constituents about gas prices. When we looked at it, gas prices have more than doubled since President Obama was sworn in. Does the President bear some responsibility for rising prices? SPEAKER JOHN BOEHNER: Well, I think the fact that he won't allow exploration-- in the Gulf, doesn't allow exploration in the inter-mountain west, won't allow us to drill in Alaska-- this is not helping—the situation. And then when you look at what the EPA is doing in terms of-- the number of rules and regulations comin' down-- the pike, those were his responsibility. He's not doing anything to make the situation better. And the fact is is that we need all of the above. We need green energy, but we also need a transition to green energy. That means more oil and gas exploration. And it oughta happen sooner rather than later. JONATHAN KARL: Well, what's the bottom line. When somebody goes to the pump and they're spending four bucks a gallon on gas, I mean do-- do they-- does part of the blame there lie with the President? SPEAKER JOHN BOEHNER: They're gonna blame somebody. All right? And-- the fact is he's done nothin' to help the situation. JONATHAN KARL: Okay. Now this week we're gonna see the oil companies report their profits. And we've already seen the analysts say it's gonna be way up. Exxon Mobil last quarter, $9 billion in profits in a single quarter. Is there something obscene about gas company-- oil and gas company profits being that high when Americans are struggling just to fill up the tank? SPEAKER JOHN BOEHNER: Listen, everybody-- everybody wants to-- to go after the oil companies. And, frankly-- they've got some part of this to blame. All right? But the fact is is there's a limited supply of oil around the world. There's-- unrest in the Middle East driving up the price. They happen to hold the assets. They're the lucky ones at this point. But-- but they oughta do everything they can-- to help us-- produce oil and gas at a lower price. JONATHAN KARL: --in-- in a single quarter? SPEAKER JOHN BOEHNER: Right. Listen, they're gonna pay their fair share in taxes and they should. JONATHAN KARL: Okay. Pay their fair share in taxes. That-- I mean they're also gettin' a lot of tax subsidies. You know, by-- by some estimates $5 billion-- a year, maybe considerably more. JONATHAN KARL: Why-- why-- why do they get that? SPEAKER JOHN BOEHNER: --if you have-- listen, if you've got-- investments and you're depleting those-- in-- in most businesses-- you get depreciation. In the oil and gas business, they get an oil depletion allowance-- which takes the place of what would be depreciation in any other business. JONATHAN KARL: But they're makin' money off us. I mean we saw the-- the-- I'm sure saw that the former CEO of Shell Oil came out and said that the company-- they don't need these subsidies. SPEAKER JOHN BOEHNER: I don't think the-- the big oil companies-- need to have the oil depletion allowances. But for small, independent-- oil and gas producers-- if they didn't have this-- there'd be even less exploration in America then there is today. SPEAKER JOHN BOEHNER: --certainly something that we oughta be looking at. JONATHAN KARL: Of doing away with these subsidies? SPEAKER JOHN BOEHNER: We certainly oughta take a look at it. JONATHAN KARL: Well, the President's proposed doing away with eight-- eight different subsidies. This would be about $4 billion a year. You-- you think that's worth doin'? SPEAKER JOHN BOEHNER: I think we gotta take a look at it. 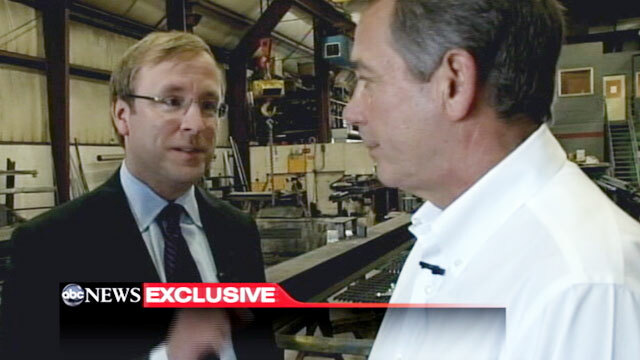 SPEAKER JOHN BOEHNER: --I wanna see the facts. I don't wanna hear a bunch of political rhetoric. That's look at the facts. And what will it do to have-- its impact on jobs. You know, the number one issue in my district and around the country is where are the jobs? And I wanna know what impact this is gonna have on job creation here in America. SPEAKER JOHN BOEHNER: Of course. SPEAKER JOHN BOEHNER: The house has passed dozens of bills to expand energy production in America. The Senate has passed only a few. But the President's made clear, he doesn't wanna-- he doesn't wanna sign any of these into law. We're gonna have-- bills comin' out of the Congress here next month. We're gonna send 'em to the Senate. Let's see what they do. And let's see if the Senate-- if they pass 'em, whether the President will sign 'em. It's time for us to do all of the above-- if we're going to be serious about bringing down energy costs and cleaning up our air. We can do-- we can do all of this if we were willing to do all of the above. JONATHAN KARL: But what right now can be done? Right now about gas prices? I mean we're lookin' at potentially $5 to $6 a gallon by the summer. What-- what-- what can you do right now? SPEAKER JOHN BOEHNER: I think if we began to allow-- more permits for oil and gas production it would send a signal to the market-- (BEEPING) that America's serious-- about moving toward energy independence. That signal, in and of itself-- would-- would calm these prices down quite a bit. SPEAKER JOHN BOEHNER: If the market-- if-- if the-- leases were released today, you'd send a signal to the market. And if the market began to believe that America was gonna move toward energy independence, you'd see these prices begin to come down immediately. JONATHAN KARL: How-- how bad is the situation? What are you hearing from your constituents? SPEAKER JOHN BOEHNER: They don't like it. And it's gonna get worse. And they're really not gonna like it. But if the American people get engaged, maybe they can put enough pressure-- on the Congress and on the President-- to get serious about having a real energy policy in America instead of just talkin' about it. SPEAKER JOHN BOEHNER: Oh, that's not true. There was $38.5 billion worth of cuts in this bill. Real cuts. It'll save $315 billion over the next 10 years. Remember, the President wanted to spend $79 billion more than what we're gonna spend this year. We're gonna spend $79 billion less because we went in there and said, "We're gonna cut spending." SPEAKER JOHN BOEHNER: They wanted-- (OVERTALK)--more spending cuts. I don't blame 'em. I wanted more too. But I was in a negotiation with a Democrat-controlled Senate and a Democrat in the White House. And we got as good as we could get. Listen, we wanted to cut $100 billion. And we got $79 billion. That's not bad. JONATHAN KARL: But what about that estimate of $300 million this year? I mean that's-- that's the cuts that actually take effect this year. SPEAKER JOHN BOEHNER: --about outlays and budget expenditures. The fact is is $38.5 billion worth of spending that was cut, that over the next 10 years will result in $315 billion worth of lower spending. JONATHAN KARL: Now are you gonna ask your members to vote to allow the government to borrow even more money? SPEAKER JOHN BOEHNER: I believe it's responsible to increase the debt limit. But the President wants us to increase-- the debt limit-- it's time to cut up the credit cards. And that means that we've gotta have real cuts in spending. And we're not gonna be talkin' about billions here. We're gonna be talking about trillions. SPEAKER JOHN BOEHNER: We need to-- (OVERTALK) --cut spending. We're on-- we're on a path to-- of fiscal nightmare. We have an opportunity to do something about it and we should. I have offered to the President all year long, "Mr. President, come on, lock arms. Let's go jump out of the boat together." We've gotta control discretionary spending. About 1/3 of the budget, we've been fightin' about all year long. But we also have to do something about the entitlement programs. If we don't do anything, they're not gonna exist because they're not gonna be affordable. And the greatest danger we have-- in America today is doing nothing, which is basically what the President's proposing. I think it's time-- for all of us as Americans to have an adult conversation with each other about the serious challenges that face us. And dealing with these long-term-- fiscal problems-- has to be done and it needs to be done now. SPEAKER JOHN BOEHNER: I told the President, "We're not raising taxes." SPEAKER JOHN BOEHNER: Raising taxes at a time when we're expecting the very people we're gonna raise taxes on to invest in our economy-- and to create jobs. So-- are we gonna ask people to invest and create jobs or are we gonna ask them to give that money to the government? That's not-- that's not smart. SPEAKER JOHN BOEHNER: And it's not gonna get the economy movin'. JONATHAN KARL: Now Paul Ryan's budget, which you voted for, which all but a handful of your members voted for, it ends Medicare as we know it. JONATHAN KARL: Okay, what does it do then? SPEAKER JOHN BOEHNER: --to call it somethin' else, because (LAUGHTER) that's what it is. It transforms Medicare into a plan that's very similar to the President's own healthcare bill. SPEAKER JOHN BOEHNER: It-- it covers-- it covers all the same things that'll be covered today. And it transforms the program so it's there. It wouldn't affect anyone that's 55 or older. SPEAKER JOHN BOEHNER: Not one. But for those 54 and younger, if we don't do something-- to transform-- these programs, they won't exist. And I do believe that-- Paul Ryan has an idea-- that's certainly worth of consideration in terms of how do we-- how do we do this in a more efficient way? And, frankly, havin' the private sector-- run the program is far more efficient than havin' the government run it. SPEAKER JOHN BOEHNER: I voted for it. SPEAKER JOHN BOEHNER: I'm for it. SPEAKER JOHN BOEHNER: It's our idea. Right? It's Paul's idea. Other people have other ideas. I'm not wedded to one single idea, but I think-- it's-- it-- we have a plan. Where's the President's plan-- to deal with the nightmare-- that's facing Americans? He set up a deficit reduction commission a year ago. They did a lot of really good work. And while I didn't agree with everything they did, there was a lot in their-- in their proposal that was worth of consideration. And what did the President do? He took exactly none of his own deficit reduction commission's ideas. Not one. Come on? It's time to grow up and get serious about the problems that face our country. JONATHAN KARL: Do you trust him? Will you negotiate with him on this stuff? SPEAKER JOHN BOEHNER: I do. I get along with him fine. I wouldn't say we're close friends, but it's-- we're polite. We get along fine. We look each other in the eye and we're straight and honest with each other. SPEAKER JOHN BOEHNER: Didn't sound like it in the speech he gave (BACKGROUND VOICES) a couple weeks ago. You know, I met with him, along with the other leaders-- before he gave that speech that day. And we had a real honest conversation about raising taxes. And both Senator McConnell and I made it clear to the President we're not raising taxes. And he seemed to understand that we weren't gonna raise taxes. We debated about how we were gonna move forward in terms of the kind of changes we're gonna make. And it was a serious conversation. Then the President goes out that same afternoon and gives this partisan, political campaign speech-- that-- frankly, I was-- I can't tell you how disappointed I was in the President in not bein' honest with the American people-- about the big problems that we face. And the fact that it's time to own up, fess up and quit whistling past the graveyard. JONATHAN KARL: What-- why do so many Americans, though, favor raising taxes on-- on the upper income-- as-- as a solution to this? SPEAKER JOHN BOEHNER: Oh, listen. You know, if-- if you didn't have to pay taxes-- and you could force somebody else to, why not? It's the old adage that legislators talk about. Don't tax me. Don't (BUZZING) tax me. But tax the man behind the tree. SPEAKER JOHN BOEHNER: --raising taxes on the very people we expect to invest in our economy and to create jobs-- is a bad idea. SPEAKER JOHN BOEHNER: --not-- we are not in the business of raising taxes. It's not gonna help our economy. Americans want our economy goin' again. They wanna go back to work. Wanna feel better about the job they have. And raising taxes on those very people-- will hurt job creation in our country. JONATHAN KARL: Okay, finally, I gotta ask you some Presidential politics stuff. Not whether or not you're running, but are you? JONATHAN KARL: --are you satisfied with this field? SPEAKER JOHN BOEHNER: --it's-- it's a wide open-- Presidential primary. I'm not sure that we've seen all of the candidates we're gonna see. I'm as anxious as anybody else-- to see-- all of our candidates come out so we can get an idea of, all right, what's the field look like. But I'm confident that we as a party will have-- a strong candidate. And-- and I think the problems-- President's got a lot of problems of his own. Whether it's high gas prices, whether it's how Americans feel about Obamacare. Or how they feel about our economy and jobs. And-- reelections for incumbent Presidents-- are a referendum on-- on their activities. I think the President made a lot of promises-- and delivered very little. And I think-- the voters will take care of that next November. JONATHAN KARL: I saw one commentator say we could see a race between a failed President and an unelectable challenger. And Republicans are on the verge of squandering what could be the opportunity of a lifetime. 15:00:35 SPEAKER JOHN BOEHNER: Listen, right now my biggest concern is how to get our economy goin' again and how to get the American people back to work. That's-- that is issue number one. And issue number two-- is dealing with our long-term fiscal crisis. The next election shouldn't matter to anyone. But what we oughta be doin' is doin' the right thing for the country right now. JONATHAN KARL: Is Donald Trump a serious candidate? You see him near the top of the polls. SPEAKER JOHN BOEHNER: Interesting-- candidate. JONATHAN KARL: Won't be getting-- your support I-- I don't imagine? SPEAKER JOHN BOEHNER:I-- I-- I'm-- I'm not gonna get myself involved in these-- Presidential primaries. They can sort this out all by themselves. SPEAKER JOHN BOEHNER: Oh, it's-- (OVERTALK) --it's way-- it's way too early. JONATHAN KARL: --he can be? JONATHAN KARL: So you think he can win? SPEAKER JOHN BOEHNER: Who knows. But if-- the economy doesn't get better, I don't think he'll win. If people don't feel better about government run healthcare, I don't think he'll win. And if gas prices are $5 or $6, he certainly isn't gonna win. JONATHAN KARL: All right. Speaker Boehner, thanks for-- talking to us here. SPEAKER JOHN BOEHNER: Nice to see you. JONATHAN KARL: Greenville, Ohio. Appreciated it. SPEAKER JOHN BOEHNER: Glad to be here.